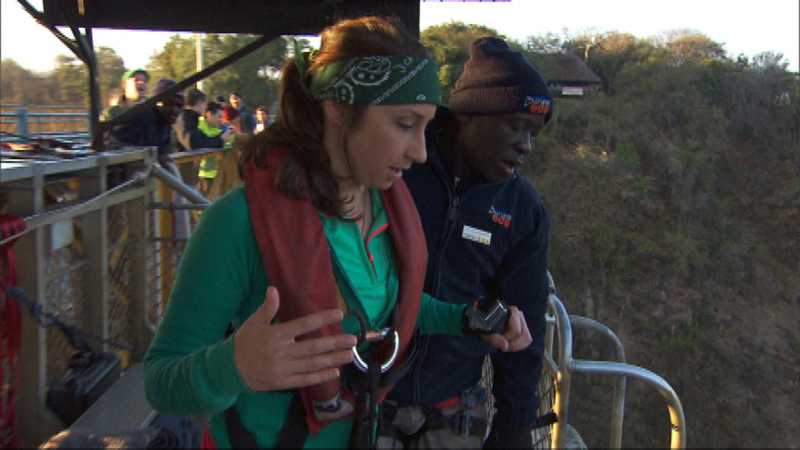 Bungee jumping 364 feet from Victoria Falls Bridge was a Roadblock that put Diana (#TheGreenTeam) and Tanner’s (#TeamTexas) fear of heights to the test. Diana was close to tears, taking in the jump that would send her free falling between the vertical cliffs, while Justin stuck by her side as her main support. She made the jump, repeating, "Oh my God, oh my God," all the way down. Meanwhile, as Tanner realized just how challenging the task would be for him, he said, "I’m going to cry... I’m scared out of my mind." After reading the heart rates on their activity trackers—information that would be referenced later—Diana marked down a heart rate of 137 and Tanner recorded his at 128. Check out the eight other pulse racing moments from Ep. 6.